Dieting isn’t always easy, but it is the only way that you can lose weight fast. Dieting doesn’t have to leave you starving, but it does need to be a lifestyle change that results in you making healthier food choices for each and every meal. There are plenty of fad diets that you can choose from, but there are two diets that are gaining in popularity right now. 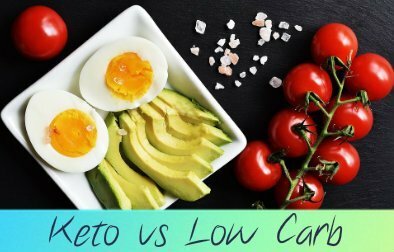 The keto diet and the low carb diet are both popular options if you want to lose weight fast, but it is time that you learned what makes these diets different from one another. It is the only real way that you can choose the diet that is best for you. In both diets, carbohydrates are restricted and this is what makes the diets effective for fast weight loss. Even though decreasing carbs is the goal of both diets, the amount that you restrict the carbs is one of the biggest differences. A low carb diet does not designate the amount of carbs that you eat each day; it just results in you limiting the carbs that you consume. However, with the keto diet you have a restriction of less than 50 grams of carbs each day. This is a very low amount and is why you can drop a significant amount of weight fast with the Keto Diet. One diet is low carb, but the other diet is really low carb. You might think that both diets are equal when you are looking to lose weight, but this is not the case at all. You actually can see an increase in weight loss with the keto diet. This is because you are restricting your carb intake at a higher rate and it helps you to lose more weight fast. If you are looking for a diet that will offer the best results, and don’t mind setting extreme limits on your food choices, the keto diet is often the best choice that you can make. No diet is easy, but the Keto Diet requires a lifestyle change that is not easy. You have to transform the way that you eat and the active lifestyle that you maintain in order to eat with the Keto Diet in mind. It is possible to restrict carb intake to this level, but it is not something that happens overnight.